We all want to deliver a successful presentation. But the success of our presentation is not entirely in our hands. It depends on many things. On how you have planned the content, how you have designed the slides and how you deliver the presentation. But even then your presentation can go haywire. And the reason can be as small as 'improper projection'. I don't know about other countries but certainly here in India a lot of times the projector happens to be a presenter's biggest enemy. Ruining the look and feel of the best of slides. 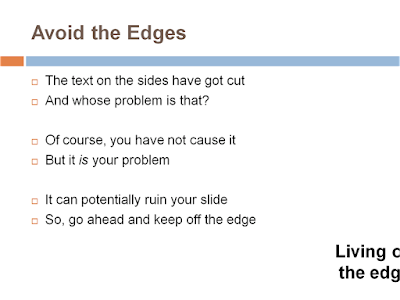 One possible problem which I have seen quite often is that the edges of the slides get cut due to adjustment problems. The projection does not fall in sync with the screen on the wall. If you call the IT guy or try your hand and the solution does not come within 5 minutes, stop trying and move on. This is however a 'cure' approach. Curing the problem after it occurs. One simple preemptive solution would be: Avoid text on the edges of the slides. 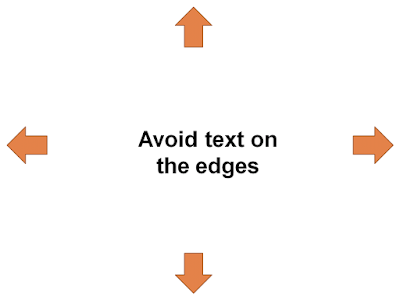 Maintain a good gap between the edges and your text on all the four sides of the slide. This solution takes away a lot of unnecessary tension from your mind. Inspite of your best efforts if your text does get cut you should never say; "The text is getting cut due to a projector problem." Remember one thing. Every single problem which reduces your presentation's effectiveness is YOUR problem. Because it is YOUR presentation which is getting ruined or impacted. An excuse will not help. Tackle the problem and move on. If you can come 30 minutes before the start and check these projector problems, that will be better. I am not too sure about this approach. I totally understand what you are saying, but by trying to avoid the edges to avoid misalligned projectors, your slides might end up looking less than perfect on projectors that ARE working. I guess the only way to be sure is to try and test out the venue beforehand... but of course this is not always possible. I understand your concern but under the circumstances where one cannot visit the venue much in advance, this is a 'safer' option. I don't see much of a problem with the aesthetics because we need not leave too much space on the sides. Presenters who have faced there problems would know how much space they need to leave. Good reminder about the need to rehearse before the presentation.